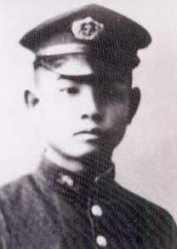 On July 27, 1945 , Flight Petty Officer 1st Class Tsutomu Kawajiri died in a special (suicide) attack at the age of 17 when submarine I-53 launched his kaiten manned torpedo at an enemy transport convoy. On July 14, 1945, submarine I-53 made a sortie from Ōtsushima Kaiten Base in Yamaguchi Prefecture with six kaiten pilots who were members of the Kaiten Special Attack Corps Tamon Unit. Submarine I-53 was headed for a patrol between Okinawa and Leyte Gulf in the Philippines. Kawajiri was from Hokkaidō Prefecture, attended Asahikawa Commercial School, and was a member of the 13th Kō Class of the Navy's Yokaren (Preparatory Flight Training Program). He received a promotion to Ensign after his death by special attack. At this time I fortunately have obtained an honorable place to die as a young Japanese man. I will work hard to sink instantly an ugly ship. In the 18 years  since I received life in the sacred era of Shōwa, my aspiration has been the skies. Even though the clouds in the skies could have been my grave marker, I became a member of the Kamishio  Special Attack Corps as crewman for a new weapon. I wholeheartedly will push forward to make a taiatari (body-crashing) attack. Even though up to today I did not have the early opportunity that I intensely desired to display my abilities and live long, here is a good opportunity for me to be able to make a sortie. As a young Japanese man, I know that there is nothing that surpasses the happiness and joy of this. As your child and as the oldest son of the Kawajiri Family, I will commit myself to carry out my duty to the end, which I have no qualms about. Please rest assured. Please be glad that I will be able to kill a thousand men at the young age of 18. There are no words to say to you and everyone for my lack of consideration in dying before you. There is only a single word to please forgive me. Nevertheless, now when families are ignored for the great cause and when the greatest crisis in the divine land Japan has arisen, I believe that even dying before you out of loyalty also is filial piety. I understand well the many instances of kindness that I have received from my birth, and I feel sorry that I will go and fall without having repaid any of this kindness. Now I am waiting anxiously for this occasion when I can show filial piety in the world somewhere. I will make a sortie without any worries about the family. After I die, it is regrettable that I cannot encourage my younger brothers and sisters  to follow in my footsteps. If you are able, please teach my younger brothers and also my younger sisters when you raise them that they should follow in my footsteps. This is my final request. Even though Japan is assailed by all types of dangers, I certainly will become a shield for the Empire of Japan as an ogre to protect the country. Although I will disappear in the southern seas as a stone in the Greater East Asia breakwater, my spirit will remain forever and will protect my hometown's mountains and rivers and my countrymen. I am determined to kill by myself all of the American fiends. At the end of the faraway southern seas, I will pray for everyone's health. I thank you, our neighbors, Yamaya, Tsubotani, Hatakeyama, Mizuno, Nakagawa, Yamamoto, and Katō for the great kindness shown to me for many years. Please give my warm regards and tell them that I gladly went and died. 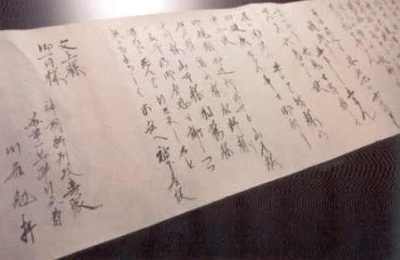 The letter comes from Matsugi (1971, 145-7). The biographical information in the first paragraph comes from Konada and Kataoka (2006, 289-91, 299-300, 374), Mainichi Shinbunsha (1968, 84), Matsugi (1971, 145), and Mediasion (2006, 66-7, 86, 98). Mainichi Shinbunsha (1968, 84-5) has a version of Kawajiri's last letter, but it only includes the first eight paragraphs translated above. The last part of the letter starting with the paragraph that begins "Even though Japan . . ." is not included. 1. Different pages in two sources provide conflicting dates for Kawajiri's death. Konada and Kataoka (2006, 299-300) and Mediasion (2006, 66) give the date as July 27, 1945. Konada and Kataoka (2006, 374) and Mediasion (2006, 86) give the date as July 29, 1945. 2. The traditional Japanese method of counting age, as in much of East Asia, regards a child as age one at birth and adds an additional year on each New Year's day thereafter. This explains why the letter indicates his age as 18 whereas the current way of counting age based on his birth date in Matsugi (1971, 145) indicates that his age was 17 at time of death. 3. Kamishio means "divine tide" and refers to the Navy's Kaiten Special Attack Corps. This term was used after the word "kamikaze," which means "divine wind," was applied to the Navy's Air Special Attack Corps. 4. The number of brothers and sisters is not specified in the letter. He may have had one or more brothers and one or more sisters.